I know I know, its such a simple recipe. I cant help write about it nevertheless. If not for anything, I want to record how good this turned out to be. Growing up, potato was an integral part of my meal everyday. E.V.E.R.Y.D.A.Y. My mom was pretty cool eh? She never forced us to eat anything that we didnt like. Somehow other vegetables made their presence during the rest of the day in our meals, but dinner was incomplete without potato fry. Only after I started cooking in my own kitchen, my food habits changed for good and I started exploring other veggies too – mainly cos I was bored of potato. It was so occasional and thats why it had a place in my special books, again. Whenever I stay at parents, potato fry is a must and needless to say I go back to those beautiful days where there were no worries at all. I would eat what I fancy and yet stayed healthy. Sigh. Wish I could be like that now. Ok, all that put aside, who wouldnt like potato? So this is for all potato lovers like me. Boil potatoes with just enough water in a cooker for 2 whistles. The potatoes should not be overcooked. Run them in cold water, remove the skin and cut them into large squares. Set aside. In a nonstick pan, heat oil. Add mustard. Once they splutter, add hing and curry leaves. Reduce the flame. Add salt, turmeric powder and sambar powder. Stir it for a minute. 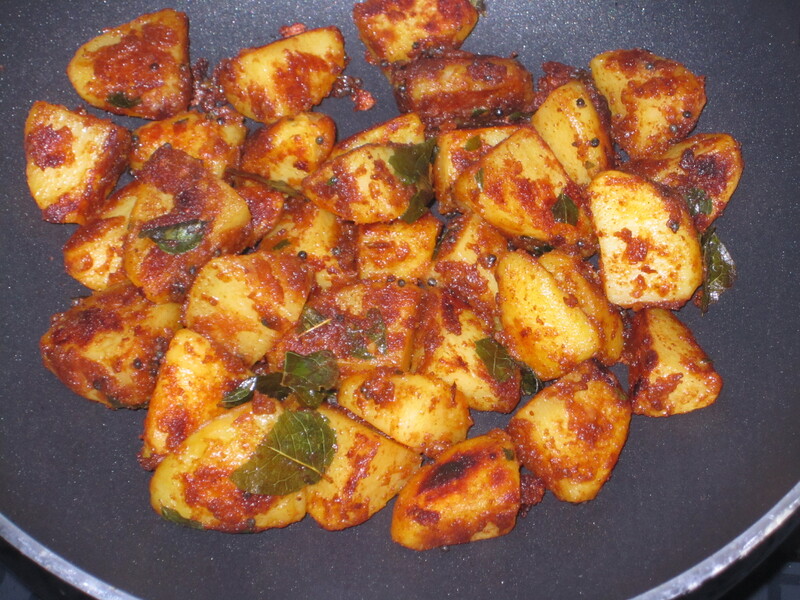 Add the chopped potato pieces and quickly toss so that the masala is coated all over the potato pieces. Do not disturb them for a couple of minutes and then quickly toss again. Repeat it until all the sides of potato pieces are crisp and golden. 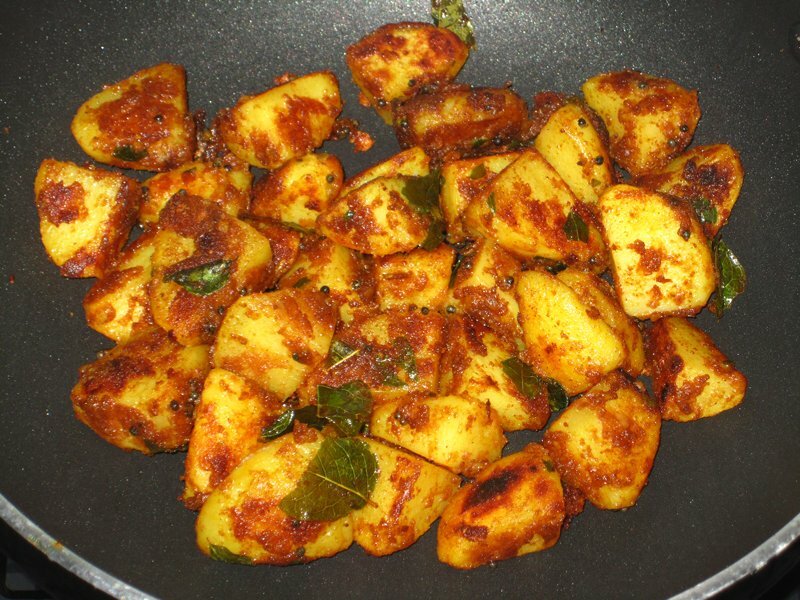 Remove from heat and serve it hot with rice along with sambar/rasam. This goes really well with variety rices like curd rice, pudina rice, lemon rice, tamarind rice, coconut rice and such like. Hostel Time .. dish .. reminded me of those good old days.. easy peasy .. get bread and make a sandhwich .. thats what we used to do ..